Our yacht the Privateer is the ultimate way to see the 4th of July Fireworks show on the San Francisco Bay! Celebrate the Nation's Birthday while enjoying two complimentary drinks such as champagne, beer, wine soda or water. 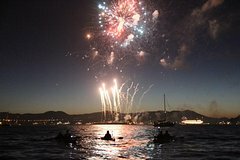 Sitting back on a classic yacht and sailing right under the fireworks on the San Francisco Bay is the best way to see this amazing fireworks show in San Francisco. Forget the standing room only crowds on Fisherman's Wharf and the Embarcadero. We're going to be on the SF Bay far from the crowds with the best Fireworks views in the world! You will meet your captain and first mate at Pier 39. They will get you checked in and boarded on the Privateer, our beautiful double-masted 28-passenger sailboat. Once everyone is comfortable, you will motor out of the docks and into the Bay. When you get out on the Bay, your captain will raise the sails! During your tour, your first mate will make sure you are comfortable and serve you your two complementary beverages - your choice of beer, wine, or soft drinks. Come spend a relaxing evening with us enjoying the beauty of the San Francisco Bay from the water!